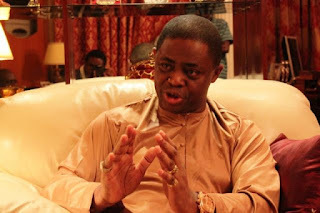 Femi Fani-Kayode, former Aviation Minister, has again restated his support for the presidential ambition of Ekiti state governor Ayo Fayose. This is contained in a statement he signed on Saturday. Fani-Kayode said he stands with Fayose because “he has immense courage”. “We come from completely different backgrounds and we do not agree on everything but we have a similar disposition and we share the same perspective on most things. “He is not bound up in fear and he is not chained down by political correctness. He speaks the raw and bitter truth and he stands up for thr weak and the defenceless. “Like me, he moves in the prophetic and his source of strength is the Spirit and power of God. “We both love God and we are both men of strength, courage, faith and destiny. “The Spirit of David and Jehu runs through us both. We neither fear death nor incarceration and we hate injustice, evil and oppression. “The truth is that he has done an excellent job in his Ekiti state and he has consistently and fearlessly stood against the evil of the Buhari administration and constantly kept them on their toes. “He is a Yorubaman who has the courage and conviction to say that he wants to be President. Why would I not stand with him and attend the launching of his campaign? “I believe that he would make an excellent President and effect the necessary changes and restructurring that our country desperately needs.